Write your will online right now. Make a will for each family member and ensure that your final wishes are carried out. 100% money-back guarantee if you are not completely satisfied! 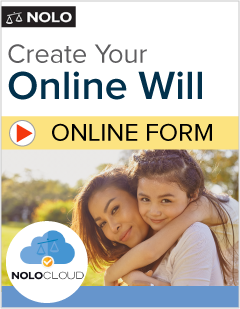 Nolo's Online Will is easy, thorough and legally valid in your state*. Enjoy unlimited revisions and secure 24-hour online access to your document -- plus, you'll receive instructions for what to do when your document is complete. One year access to your will. Multiple wills per purchase for your family. A BIG Help for a Small Estate by Douglad R.